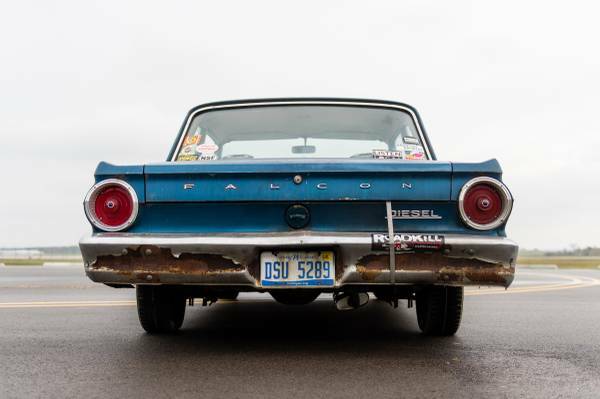 Depending on your point of view, today's 1964 Falcon could be the answer to a question that no one ever asked or a desirable thrifty commuter car. The original Falcon 170ci straight six engine and three speed manual were yanked in favor of a Mercedes OM601 4 cyl diesel and a 5 speed overdrive trans. The 2.0 diesel engine was good for 76 hp and 96 lbs of torque in a 190e so this is a eco-modder type of swap. Early 60's American iron is not normally where you find an early 80's German diesel engine or going to win any speed contests, but the seller claims the car gets 42 mpg. 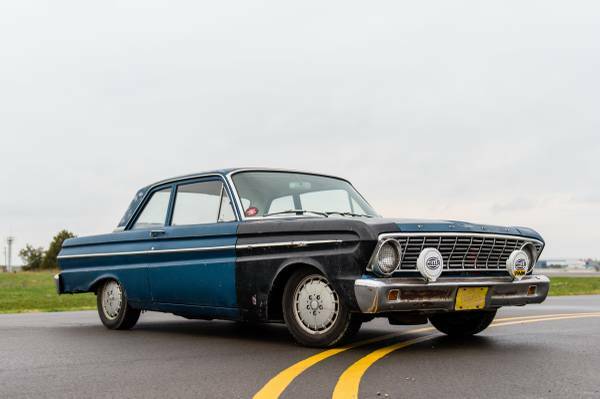 Find this 1964 Ford Falcon for sale in Grand Rapids, MI for $2,500 via craigslist. 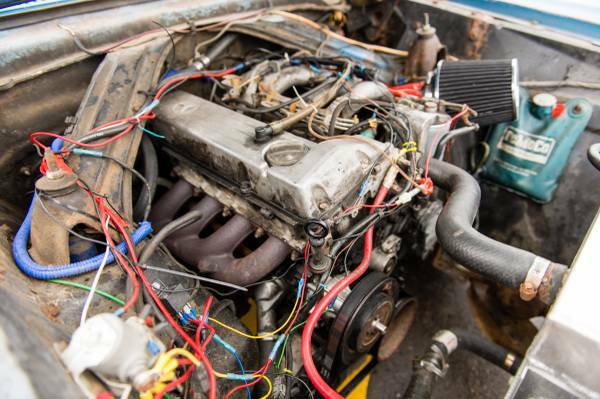 The seller here performed the engine swap and has done a huge host of maintenance to the car. The car is said to work fine as is in that it runs, drives, and stops as advertised. The car was driven from Michigan to Seattle and back within the last month. 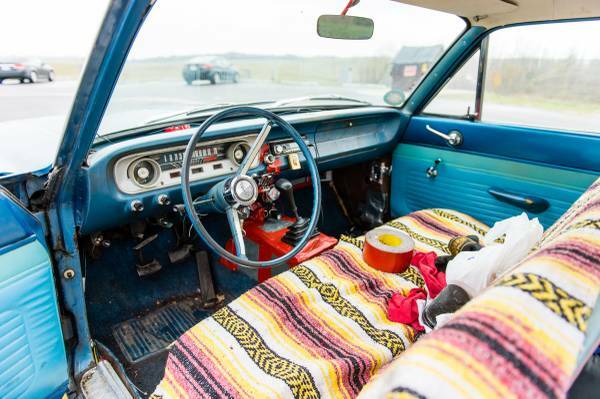 The Mexican blanket makes for an interesting seat cover here (note the roll of duct tape in the pic). The 15" Mercedes wheels make you look at the pictures over and over again in disbelief. New water pump, thermostat, and fresh fluids last month. Upgraded to 5-lug all around, 10" drums from a '64 Fairlane in front, 10" drum 3.00:1 Ford 8" rear axle (numbers matching). Upgraded to dual-circuit brakes with all new lines, wheel cylinders, shoes, and hardware. New control arms, shocks, and bushings in front. Floor pans have been replaced by previous owner and are solid, but leak a little in the rain. Rockers are solid, front frame rails and shock towers are solid. The issues that still need to be tackled are replacing the rear frame rails, sealing the leaky floor pans, and helping zip-tied rear bumper. Cory bought a 5 speed manual swap kit out of a 1994 Mercedes C280 (UK) for his C36 this week. Anyway....I hope there is a 1983 Benz 190E that has a 170ci Ford inline-6 cruising down the road. And what pray tell do the numbers match? I suppose it could be bad French for adding machine , but probably not. So much work done but so much left to be done... Ugh. This seems like a "passion project" and the owner should basically give it to someone just in hopes that they'll finish it.